Are You Broadway’s Biggest Fan? Prove It and Win a Trip to the 2013 Broadway.com Audience Choice Awards! Are you Broadway’s biggest fan? Prove it! If you can convince us of your undying love for all things Broadway, we’re sending you to the craziest and, let’s face it, best awards show of the season: The 2013 Broadway.com Audience Choice Awards! The swanky ceremony is an invitation-only event, but one lucky fan (and a friend!) will win a trip to New York City to rub elbows with Broadway’s biggest stars. 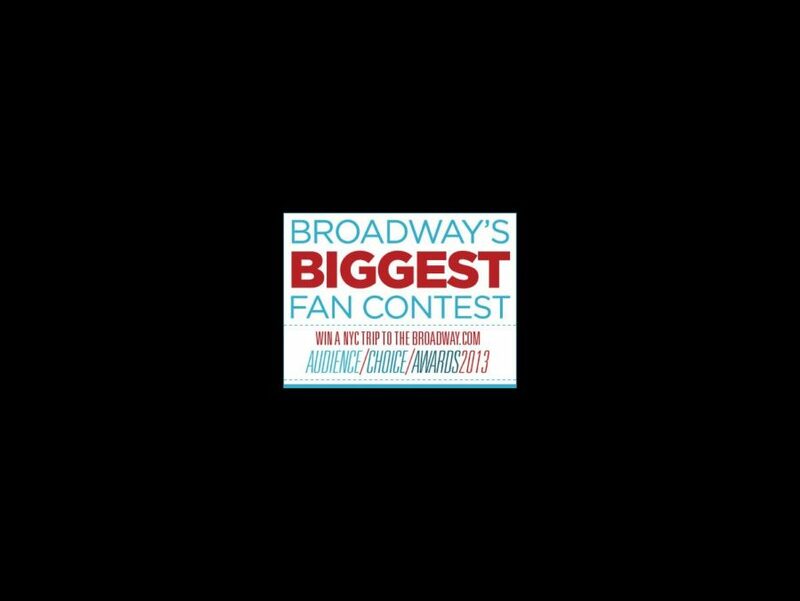 Now comes the fun part: To win our Broadway's Biggest Fan contest, all you have to do is send us a video that proves why you're the biggest Broadway fan ever and deserve to attend the Broadway.com Audience Choice Awards. Major points for creativity! Upload your video, then submit it to our snazzy contest page before April 1. You never know who you might meet at the Broadway.com Audience Choice Awards. Darren Criss, Daniel Radcliffe and Vanessa Williams have hosted the ceremony in past years, with starry presenters and winners including Clay Aiken, Stephanie J. Block, Sierra Boggess, Kristin Chenoweth, Sutton Foster, Jonathan Groff, Cheyenne Jackson, Hugh Jackman, Scarlett Johansson, Celia Keenan-Bolger, Jeremy Jordan, Judith Light, Patti LuPone, Audra McDonald, Idina Menzel, Lea Michele, Daniel Radcliffe, Alice Ripley, Laura Osnes, Aaron Tveit and many, many more! Submit your videos on our 2013 Broadway.com Audience Choice Awards official contest site. We can't wait to see the awesomeness you come up with. See you in New York City! ALTOUR is the official air and hotel sponsor for Broadway's Biggest Fan.